Whether you’re remodeling your home or on the hunt for a new one, the cost of a solar system is on everyone’s radar these days. Installing a solar energy system can give your home that extra edge while saving you on monthly utility bills and curbing your carbon footprint. Do you have a roof or area large enough to accommodate it? At present, there are two main ways of exploiting solar energy for home use. You can either produce electricity or heat water. This is a method of generating electrical power by converting sun rays into electricity using layers of semi-conducting material, usually silicon. As light rays shine on these semiconductors as they create an electric field across the layers. The stronger the sunshine, the more electricity is produced. Today, many people in Canada power their homes and cottages with solar PV systems. The efficiency of solar PV increases in colder climates and is particularly well-suited for Ontario’s climate. In a typical system, a set of photovoltaic modules, or ‘solar panels’, is installed on the roof of your home. The energy generated by these panels is passed through an inverter that creates electricity to match that coming in from the grid. This electricity either feeds into your local electricity network, or you can use it powering your appliances. 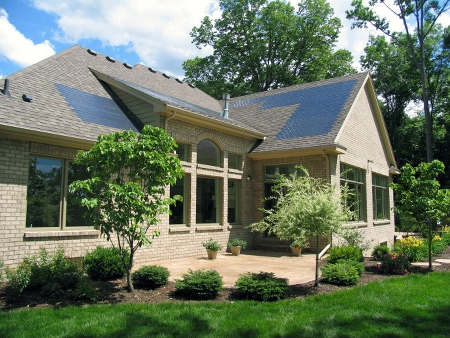 PV works best in an energy-efficient home. So, adding insulation and energy-efficient lighting, appliances, and energy efficient windows is a good idea before you install a PV system. A 5 kW solar system will produce enough energy to offset up to 75% of the average domestic consumption, depending on the system installed and home occupant’s habits and will cost around $25,000. In Ontario, MicroFIT is a program where homeowners and business owners can install a solar microgeneration plant (10 kW and under) and be paid a guaranteed rate of 80.2 cents/kWh for the power your solar system produces under a 20-year contract with the government. Solar panels typically cost in the range of 8 to 10 dollars per kilowatt of power they are capable of providing. That same kilowatt of power, when bought from your local utility company costs in the range of 8 to 10 cents. Solar water heaters use the energy from the sun to produce heat that can then be used to heat water for showering, space heating, or even solar cooling. A solar hot water system absorbs the energy from the sun in collector panels located on the roof of your home and transfers that energy to the water stored in your hot water tank. A typical well sized solar thermal system should provide households with a high proportion of their hot water needs (50% to 85%+), as well as space heating needs while reducing home energy costs. Again, before considering the purchase and installation of a solar hot water system, steps should be taken to decrease consumption, increase efficiency, and reduce the loss of hot water. A few simple changes can make a big difference. Turning down the hot water thermostat to 120°F, insulating hot water pipes and the water heater, using low consumption shower heads and repairing leaky faucets, will reduce hot water consumption and increase the efficiency of an already existing domestic hot water system. 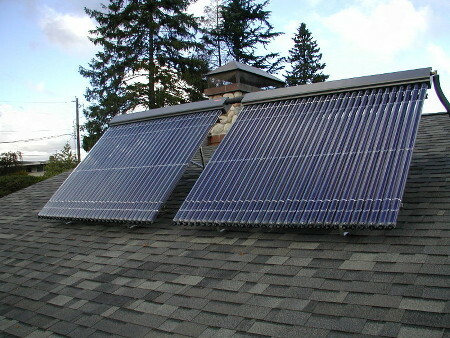 A solar hot water system will cost more than a conventional water heating system. The overall cost is determined by its size and complexity. 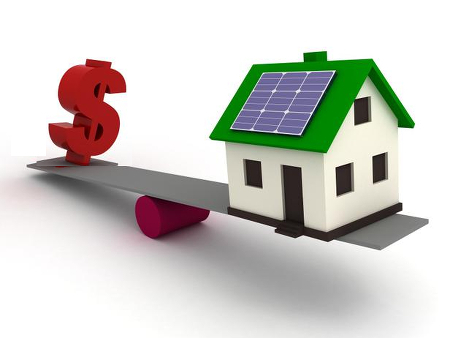 With installed costs for an average home generally in the range of $4000 to $6,000 per system, any solar water heater will have to pay itself off by saving a lot of money each year or by lasting for a very long time without the need for repairs. However, since water heating amounts to approximately 25% of a home energy costs, installing a hot water solar will take care of large proportion of home’s hot water needs (50% to 80%+), as well as space heating requirements, while reducing home energy costs and emission of global warming gasses. We, at ICFhome.ca, have installed several systems of both types. 10 KW PV system that we installed in Belwood Ontario is averaging $1000 per month under MicroFIT program (agreement signed at $0.802 per kilowatt), and evacuated tube hot water heaters usually pay for themselves within first five years, especially if the home is radiant floor heated. A marriage between solar hot water and radiant floor heating is a successful one. For more information, please call us or fill up the form “Ask us a question” in the right side column. The video bellow puts the complexity of solar energy and solar cells into everyday English. Good to read.Installing Solar Energy system is the best way to beat rising electricity costs. And I believe solar is going to be the future for home owners and business owners.